Although I was born in Kuantan, and lived there for the first 6 years of my live, I no longer go back for visits since my God parent’s passing. I don’t know which restaurant is good, which is a good place to visit. After lunch, instead of going to another beach, we decided to head to Sungai Lembing, an old mining town 40+km from Kuantan. 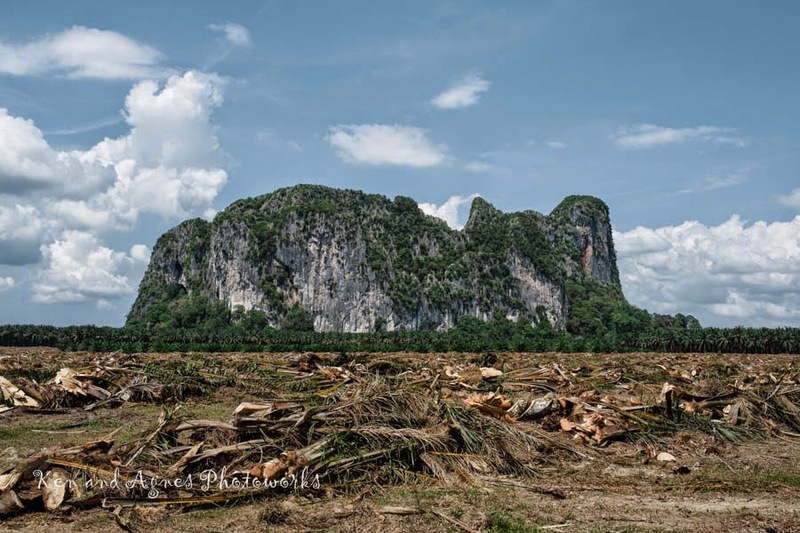 On our way to Sungai Lembing, we saw this monolith off the main road (something you won’t miss when driving from Kuantan to Sungai Lembing). Not sure where that was, we detoured and headed towards it, driving on small plantation roads. We saw quite some cars parked at the foot of the hill, and found out this was Gua Cheras, which housed a statue of a reclining Buddha. Paying a small fee, we climbed some stairs to explore it. Inside Gua Cheras, it was pretty mystical, as the whole place was shrouded by a thin layer of smoke from incense burning. 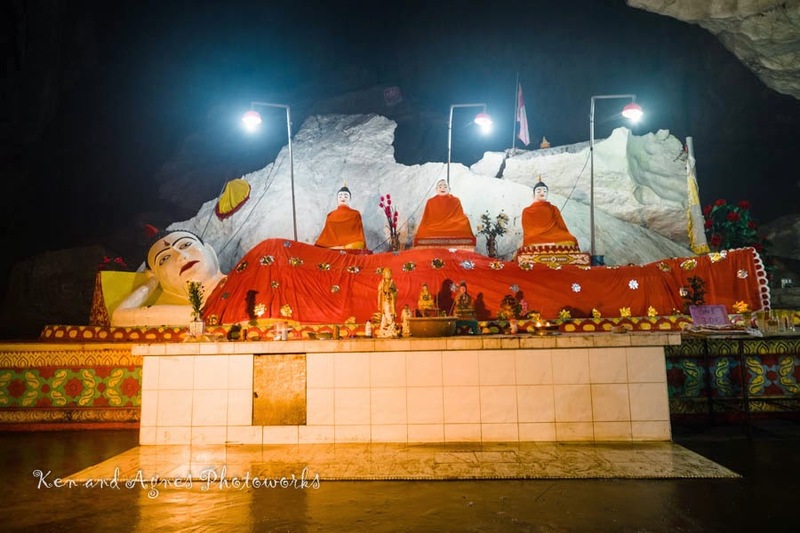 And then we saw the reclining Buddha. It was very cooling inside, probably five degrees lower than the outside heat, the smell from the incense smoke was unpleasant though, so we didn’t stay there for long. Reaching Sungai Lembing, we realised we’d missed all the morning crowd. It was quite quiet with only a few shops still opened. We stopped at Kedai Tea Lembing or 林明茶室 (No.6 jalan besar sg. 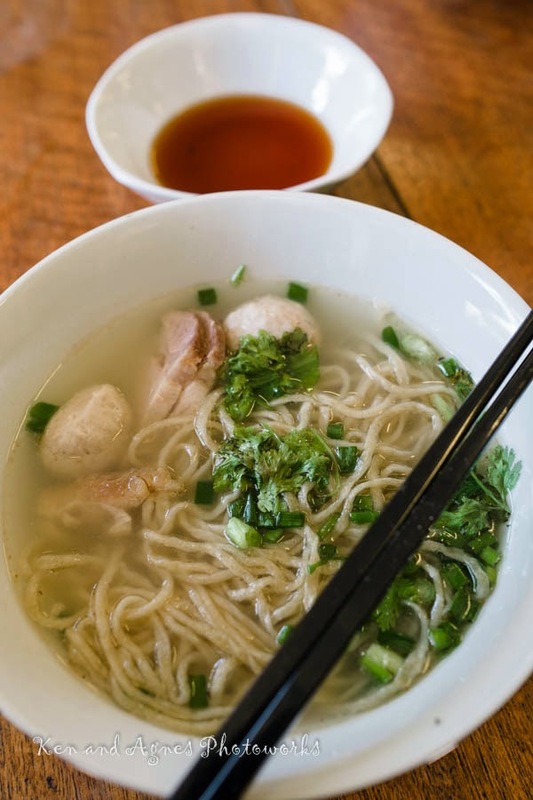 lembing, Sungai Lembing, Pahang, Malaysia) which serves big bowl tea that was common for miners, and famous for their handmade duck egg noodle. 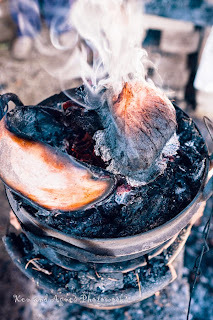 The rich soup for the noodle is charcoal boiled for many hours, but to us, it was too strong in pork taste. The Egg Noodle was very chewy and springy though. 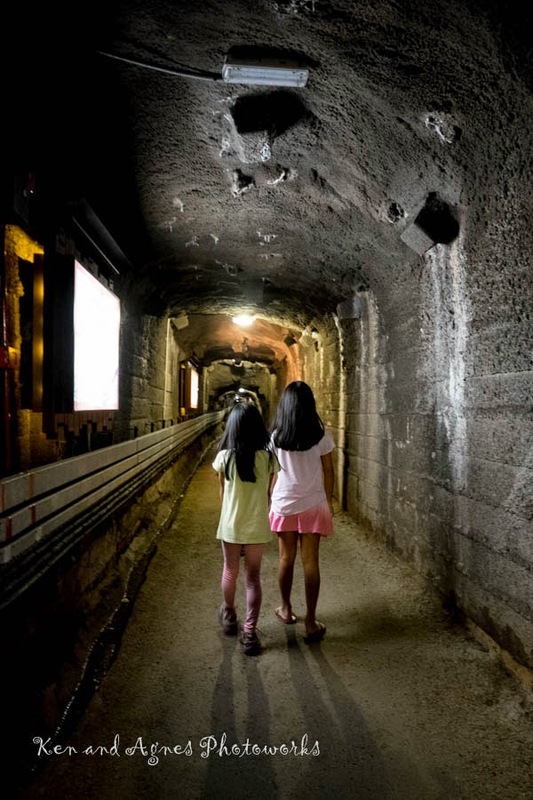 The girls wanted some ‘adventure’ so we visited The Sungai Lembing Mines, an old underground tin mine, now a museum, preserved in it most natural and original settings. It was quite eerie being under ground walking in these tunnels, the miners could not be claustrophobic to be in this profession. I was quite glad to end the tour, and went back out to the surface. 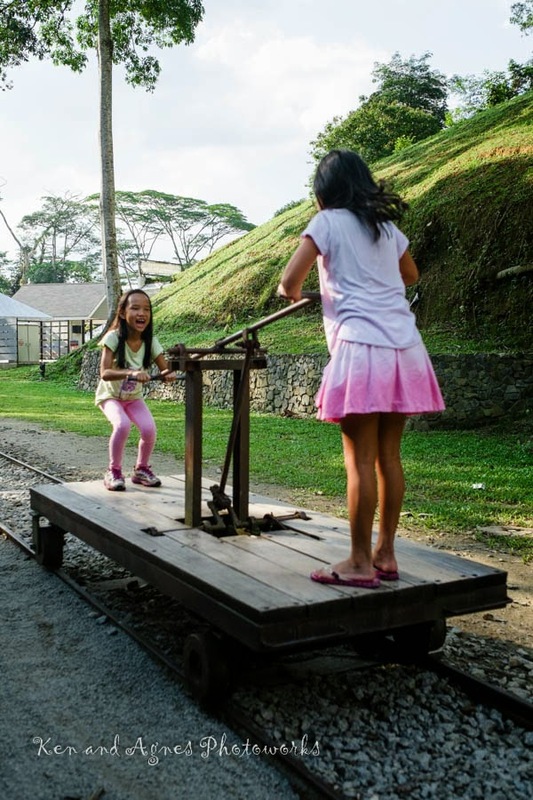 The girls have a great time navigating the handcar at the museum ground, experiencing what coordination was required to properly move the car front and back. Back to the town in the evening, the place is almost dead. But this is probably the best time for wedding shots as the tourists have almost all left. After this, it was the long drive back to KL. Long because of the bumper to bumper jam on Karak Highway. What a stressful way to end a holiday. 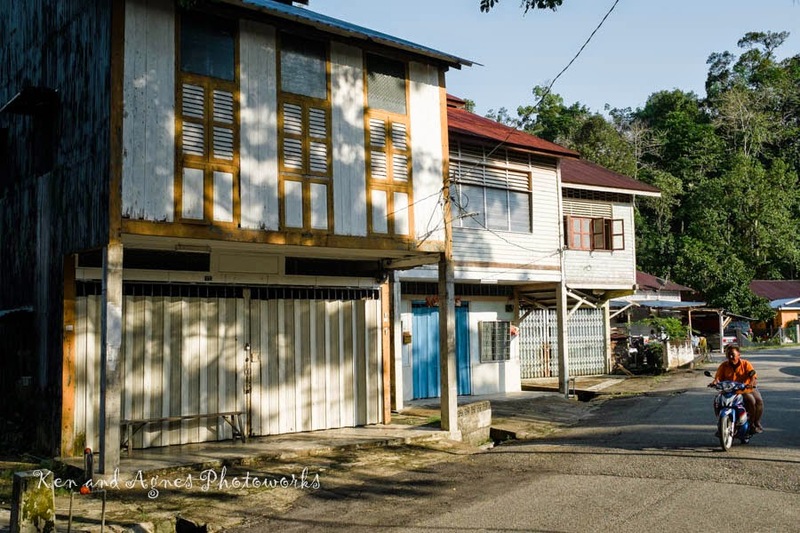 Early in the morning, the hubs drove to Kampung Kuala Besar, a fishing village near Kota Bharu. 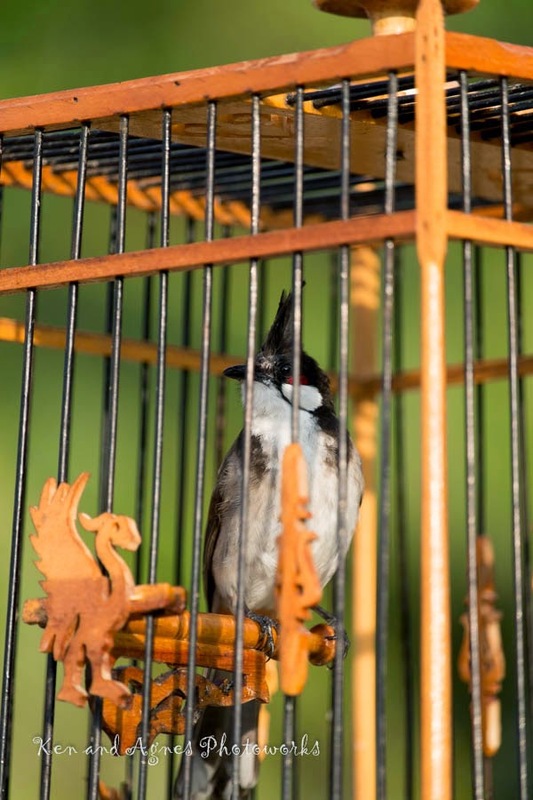 The fishermen there seem to love to keep the Jambul or Red Whiskered Bulbul, a bird which they will use in bird singing competition. Back at the hotel, we had another scrumptious buffet breakfast; after that the girls wanted to go back to Siti Khatijah Central Market to get more fake legos (yes, they sell them there at a very good price). We stopped by at Loo Coffee for a drink and ended up chatting to the owner, Alice, for almost an hour about Kota Bharu and the Chinese community. Most of the Chinese there seem happy with the ruling party, PAS. When pork is sold at a little hidden corner with high walls in Klang Valley, they are sold openly in Kota Bharu. The market near by Loo Coffee had pork sold right at its entrance, a scene not available in Klang Valley. Unfortunately, when the hubs walked over there later, the market was already closed. Alice suggested that we go to the Thai border to see the impressive and huge temples built there. We could have gone on chatting with Alice, but the girls were restless and nagging us to move on. We drove out of Kota Bharu, and headed to Tumpat, which is a district at the Thai border (the other bigger Thai Border town Rantau Panjang is inland and further away from Kota Bharu); but to cross to Thailand (Tak Bai Checkpoint) from this side of the border, a ferry/boat ride across the Golok River is required. The closer we got to Tumpat, the more Thais we saw. We actually broke for lunch at a small road side shed serving simple Thai food. Every one spoke Thai there, a guy had to take our orders in Bahasa Malaysia, and translate to Thai for the cook. Zaria was happy to have some pork to eat after so many days at the East Coast. We stopped at the KTM station there, which is the eastern terminus of KTM’s East Coast Line. 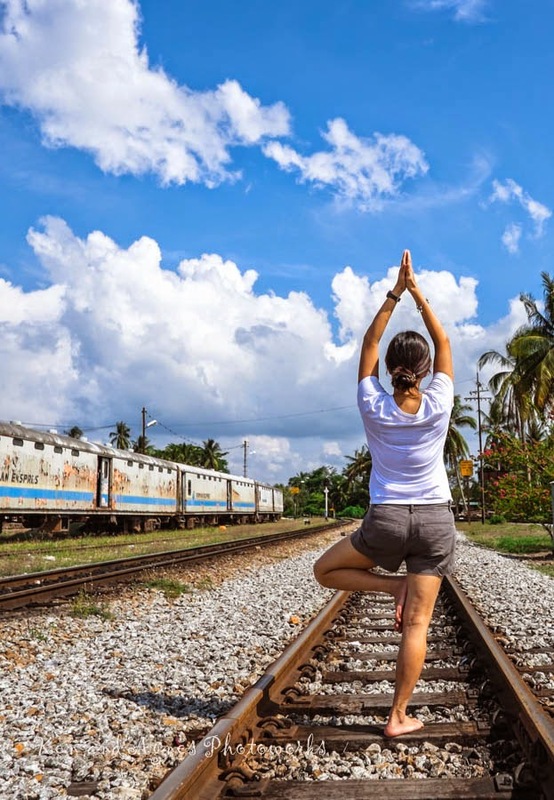 As the station was pretty quiet, we went to the track and took some yoga shots. Eventually, the station master spotted us and shooed us away. 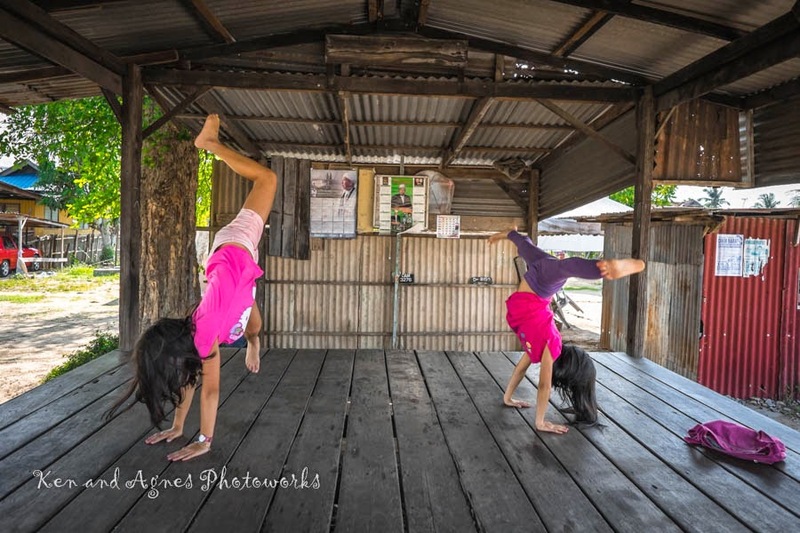 The girls, not toying with danger, stayed in a nearby shed, fooling around while waiting for us. 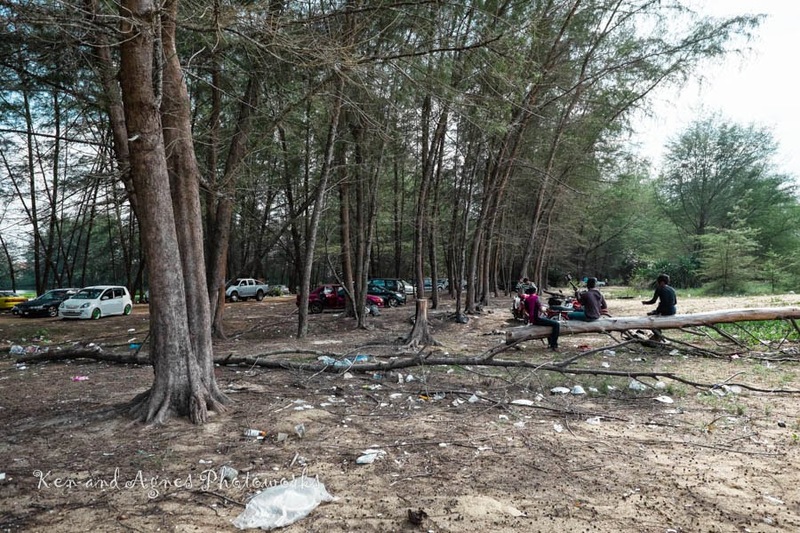 While driving to Pengkalan Kubor, the hubs decided to make a stop at Pantai Seri Tujuh. It seemed like a pretty popular beach for a picnic looking at how much rubbish had been littered and accumulated! I’d never seen a dirtier beach! I’m disgusted at how we ‘take care’ of our beaches! 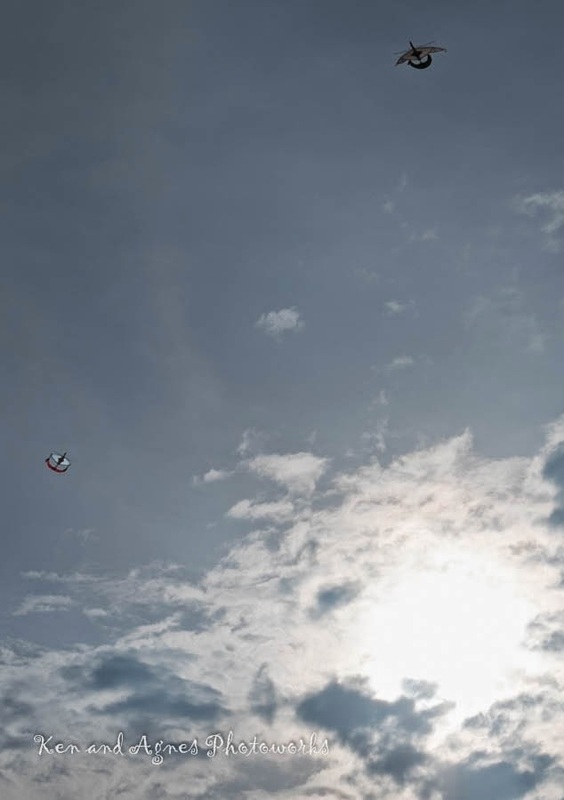 Luckily it wasn’t a wasted trip as besides being a popular picnic spot, it’s also a local favourite for kite flying. 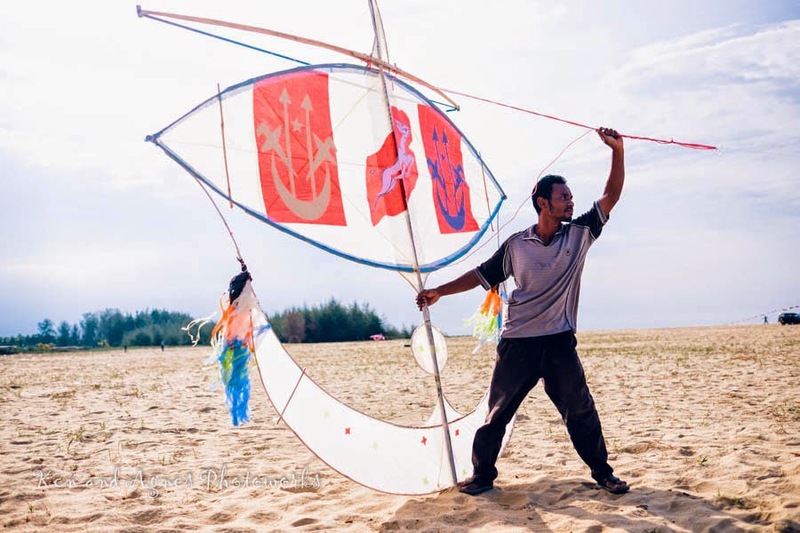 We saw some huge Wau Bulan or moon kites, being flown. We even got to go on a horse carriage ride around the village nearby, as requested by the girls. By the time we’re done at Pantai Seri Tujoh, and rushed to Pengkalan Kubur the Malaysian checkpoint at the Thai Border, the chekcpoint was already closed for the day (up till 6pm each day), so no crossing over to Thailand. We drove back towards Kota Bharu, and searched for Restaurant Kampung Kulim (GPS coordinates) at Wakaf Baru as it’s a highly recommended restaurant. It wasn’t an easy restaurant to find, as it’s hidden in some residential area. We has to ask around for direction before we managed to find it but only to know it’s closed for the week! (So that the workers can rest it seemed!) Anyway, if we were to be in Kelantan the next time, we’ll definitely want to try this place. We ended up eating at Cheng Mai Restoran, a Thai restaurant nearby Restaurant Kampung Kulim, but it wasn’t good that good. We checked out Hotel Perdana after our morning breakfast. It’s been a great stay there, love the clean gymn, the nice pool, and with super buffet spread we got every morning, and the service we got from the reception to the concierge was 5 star! After another visit to Siti Khatijah Central Market for last round of shopping, we went hunting for Kopitiam Kita ( 4357-A, Jalan Pengkalan Chepa, Taman Desa Jaya, Kelantan, Kota Bharu), another place highly recommended. 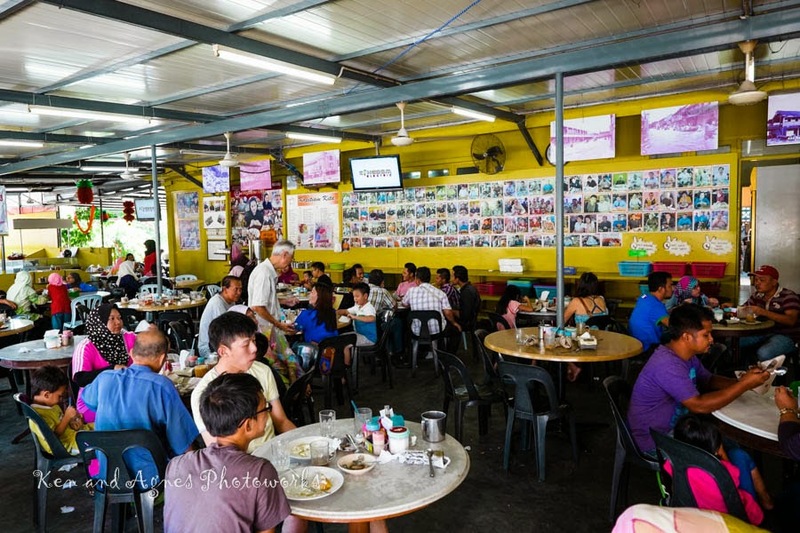 Crowded kopitiam, the place is famous for packed rice from different district of Kelantan. However, most of the rice were gone when we got there. Only managed to grab 2 packs of Nasi Ayam Goreng Kak Wok. The girls have some kaya toasts, and then some customers next to our table recommended us roti titab, famous in this kopitiam. 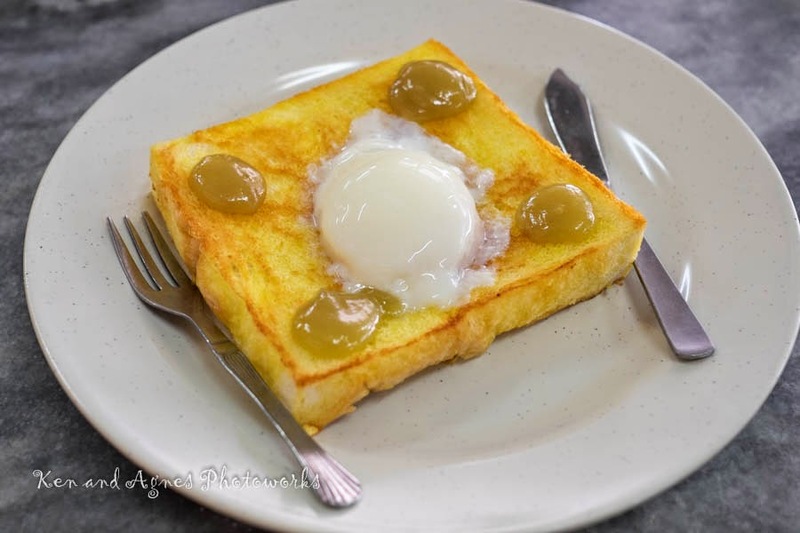 It’s just a pan fried butter toast, top with soft boiled egg, with 4 dollops of kaya dotting the corners of the toast. This was considered our early lunch, before we took the long drive down to Kuantan. Our next destination. Somewhere on the journey, we stopped at the road side for some kueh baked using brass pan over a fire fueled by coconut husks. 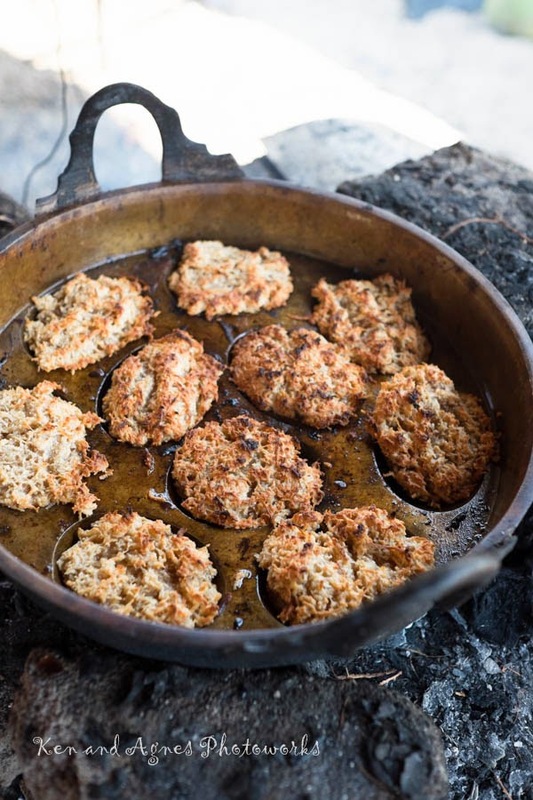 The brass pan was placed on top of the fire, and top with more burning husks to bake the kueh. It was a very fragrant and tasty kueh. 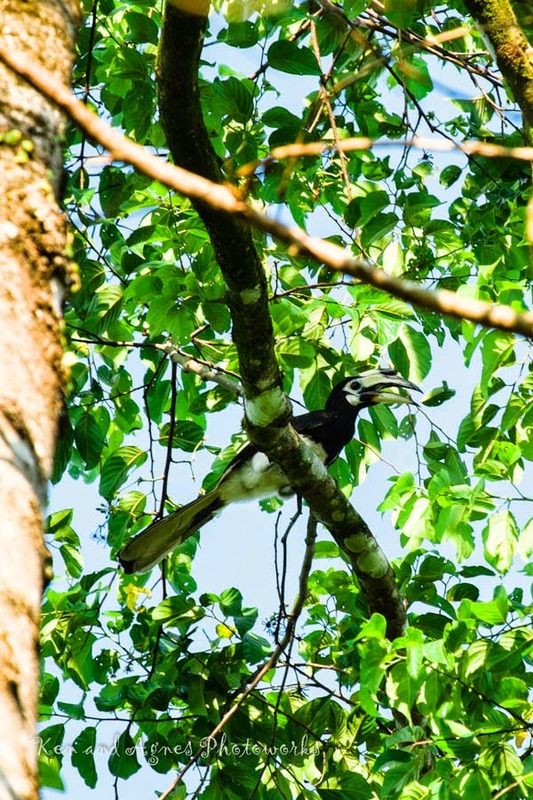 Driving inland between palm oil plantations, we spotted some wild hornbills flying about kind of like playing, the hubs decided to chase after them. After having breakfast at the hotel (which was scrumptious and part of the room rate), we headed to Siti Khadijah Central Market. Named after Prophet Muhammad’s entrepreneurial wife, it’s a name fit for this market which is mostly run by women. This has to be the highlight of anybody’s trip to Kota Bharu. We like the place so much, we went there every day for the 3 days duration we were there! 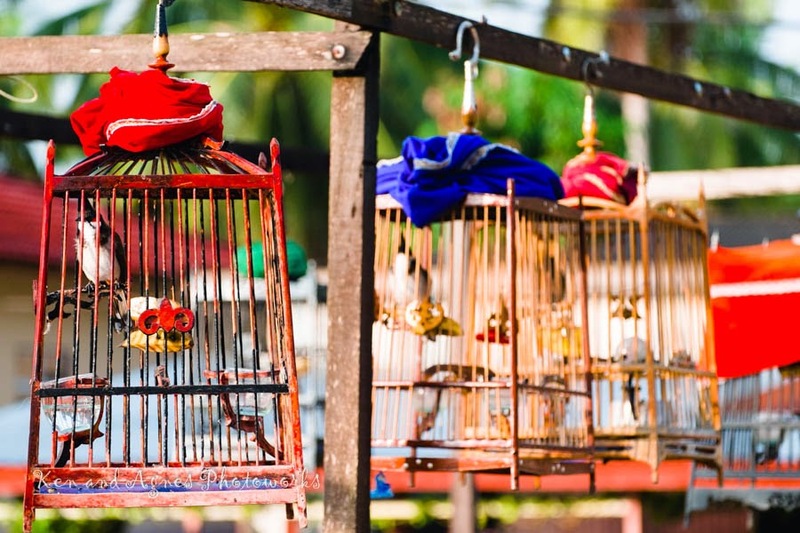 This huge market has a tremendous variety of things being sold, from the regular produce you get from any wet market, vegetables, poultry, fish and fruits, to souvenirs for tourists, i.e. batik, keropok, serunding, copper ware etc. First glance, it looked like any other wet market in Malaysia. Until we moved to the centre of the market. The octagonal central hall of the market is probably the most visually attractive part of the market, it has vendors sitting on raised platforms surrounded with their enticing goods, i.e. colourful vegetables, pickled, sauces etc. We were actually quite shock to see turtle eggs being sold by 2 or 3 vendors openly. I thought these were banned? There are not that expensive considering these are from endangered sea turtles. The only consolation is during the 3 days we were there, we didn’t see anybody actually buying these eggs. The central hall is best view from floors above, the glass roof ensures the whole place is bathed in enough light to show off the beautiful colours of the produce sold. On the second floor, we found mainly dry grocers selling a variety of things. What attracted us was the wide array of salted fish available. We went to one of the bigger stalls and asked for the best salted fish. The owner warned me it was very expensive, and asked me how many I would like to have. I gingerly (worried about the price) asked for 3 (they looked like these on the photo but lighter in colour), and waited for him to weigh and inform me of the price. Phew, they were only RM6 for 3! I love to see how spices and curry powder were sold in big bags by the weight, not pre-packed like how we get them in KL. Serunding (dried meat floss) and keropok are being sold by a lot of the stalls here. I bought some back as well, not really that fantastic although they are cheaper than KL. The 2nd flour is where all the batik sellers are. Lots of clothing, shoes, accessories can be found too on that floor. Zara got herself a fake Hello Kitty bag which was quite good quality. Back to the ground floor, a section of the market is given over to ready to eat food. There’s wrapped tapai being sold. Different kind of kueh-mueh (Malaysian cakes), some not seen before in KL. Most of them were not covered, and we didn’t dare to try them. However, we did buy a pack of Kuih Gomok (a round cake made with coconut and glutinous rice flour) and Kuih Ladu (pepper cake) each to try. Kuih Gomok is nice, but I can’t say the same for Kuih Ladu. Not sure what this seed is, and a few stalls were selling this. We tried some and they tasted like lotus seeds. Outside of the market, we saw this fish satay being sold. It’s 20sen per stick! We tried some. It’s not really fish pieces, but more like some fish flavored dough pieces. Still, it’s a cheap snack to munch on. Not far from Siti Khadijah Central Market is China Town. Most of the shops here have jawi written on their sign boards. For lunch we went to Restaurant Nasi Ulam Cikgu at the Kampung Kraf Tangan. Food display wasn’t the most appetising looking (hence no photo), but taste wise it’s ok, lots of greens, ulam to choose from. The rest of the day, we spent lazing in the hotel. Girls watched TV, while I went for a massage. In the night, we went to try out Yati Ayam Percik (847, Jln Long Yunus, 15200 Kota Bharu). A big big disappointment. We should have known when we stepped into the restaurant, with greasy floor and flies buzzing around. When the chicken (ayam percik) pieces were served, the girls asked if it was chicken covered in vomit, so unappetizing looking, and the chicken which was supposed to be barbecued was cold, cooked, probably many hours earlier. Even my neighbourhood Malay restaurants make better ayam percik than Yati. The vegetable that came in a clump with the rice was horrible as well. We rarely walk out on a restaurant but this time we did, with our food barely touched. We thought we’ll only do justice to ourselves if we went to another place for dinner since we only have 3 nights in Kelantan. This small place is constantly full, we waited a while before we got a table. Coffee, tea, toasts were great, and even the packed nasi tumpang was quite nice. After googling for a place to visit around Setiu, which is the district The Summerland Retreat is located, we decided to visit Setiu Wetlands; not knowing the place is so illusive. We only knew we were supposed to head North, and then try to locate signage. There was actually no signage, so we had to ask around, finally locating the narrow village road that led us to Setiu Wetlands. We knew we were there when we saw some boats docked with mangrove forests nearby. We asked around if anyone would bring us around, but the folks there were more interested in their game of checkers. Only a Pak Din was willing to show us around in his boat for RM150. 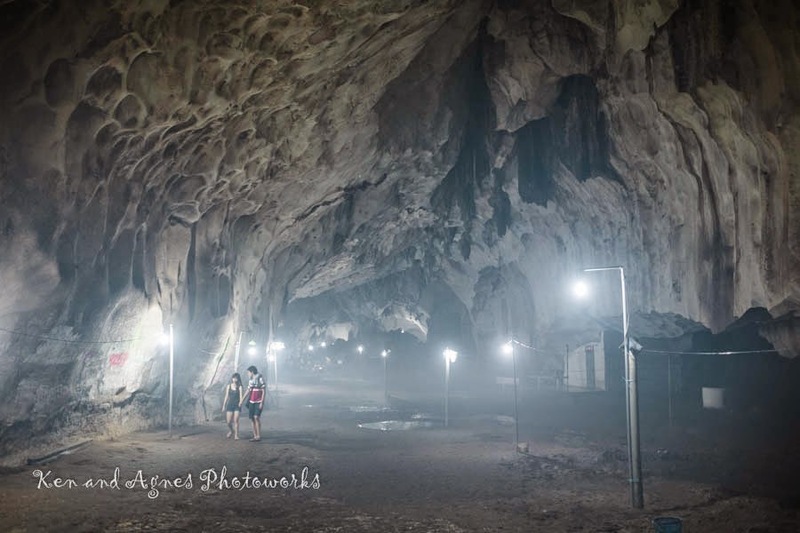 Pak Din mentioned that the place is not well posted with signage because they were afraid that big tourist crowd may actually cause harm to the environment, how true that is, we don’t know. Usually only university students come to the wetlands for research purposes, and they normally hire him to bring them around so he’s quite familiar with the area. In his small boat, he showed us around. One of the main income in the wetland area is generated through oyster farming. We passed by many of them, with floating platforms. Pak Din docked at a mangrove forest, and got us to explore a bit. He expertly watched over the shallow pool of water (for bubbles rising from sand), and dug out a couple of big clams. I’d never eaten clams this big, but they seem to be quite popular in the East Coast. He asked if we wanted to bring home to cook, and when we didn’t want, he happily pocketed them. Pak Din pointed out some strange stack horn like parasitic plants which could only be found here, according to him. They look like a big sweet potatos attached to the tree, with a few thin stalks with leaves sticking out at the ends. He took his boat out to the open sea as well, just to show us how the Peninsular looked like from the sea. He also docked at a sandy beach near the Laguna Agro Resort, pointed to us where Pulau Perhentian Besar, Pulau Perhentian Kecil and Pulau Lang Tengah are. His boat stalled when we wanted to leave, and took a while to restart. That got us worried, so we headed back soon after that as none of us wanted to get stranded in the middle of the sea. If you are visiting Setiu Wetland, do contact Pak Din to show you around in his boat. His number 0139030119. After our lunch at Pak Din’s little shop (run by his wife), it started raining. Nothing much we could do, so we headed back to our vacation home. On our drive back, we caught these. A heard of goats squeezing together to shelter themselves from the rain. Another peck of animals sharing a shelter together. While this duck was enjoying itself in the rain. At Pantai Rhu Sepuluh, we decided to try the famous Ikan Goreng Tepung (fried fish with batter). Not only fish, they have prawns, squids, and keropok lekor (fish sticks) and some other processed stuff like crab sticks, sausages and nuggets. We picked a few items for tea, and they were good as long as you don’t see how they were fried! I guess you can’t go wrong with fresh seafood. The long wide stretch of beach at Pantai Rhu Sepuluh was nice to explore after the rain. It was so difficult to get the girls to leave. Back at The Summerland Retreat, we went for a swim at the sea. The water is clean and shallow, and the waves so gentle and calm, it was the first time the girls actually enjoying themselves swimming in the sea. At night, we asked if Oya and Ena could cook us a simple dinner since we were too lazy to go out again, we didn’t mind anything, even just a plain omelette. Instead we got fried black pomfret, omelette, chicken rendang, and stir fried celery ♥♥. While having dinner, Oya shared her story of how both of them started the place together. Their story of 2 city girls giving up the city and choosing to live a simple life running a small place like this is so inspiring. Have I mentioned that one of the dreams I have was to run a small B&B in the mountains or at a beach? They are living my dream. When in East Coast, we should all try to catch the sunrise. Well, not me, the hubs did. 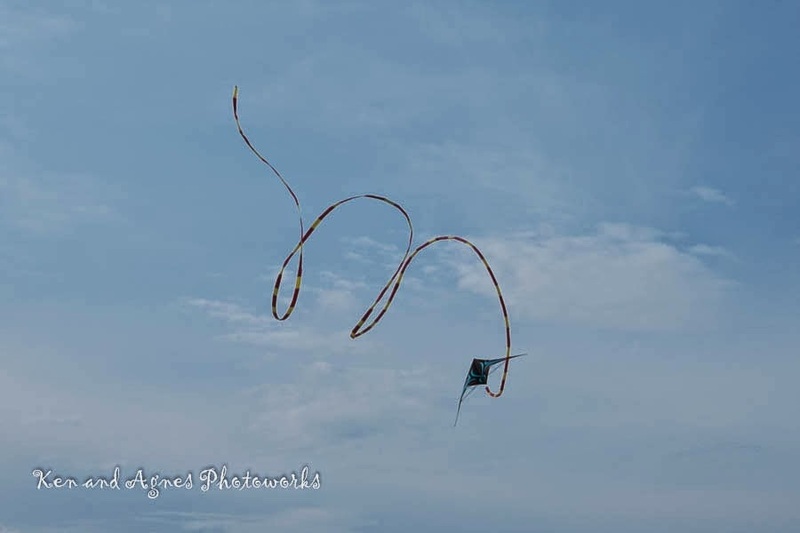 This was at Pantai Telaga Papan. For the last 3 days we stayed at The Summerland Retreat, we’d been having breakfast at this eatery recommended by Oya. 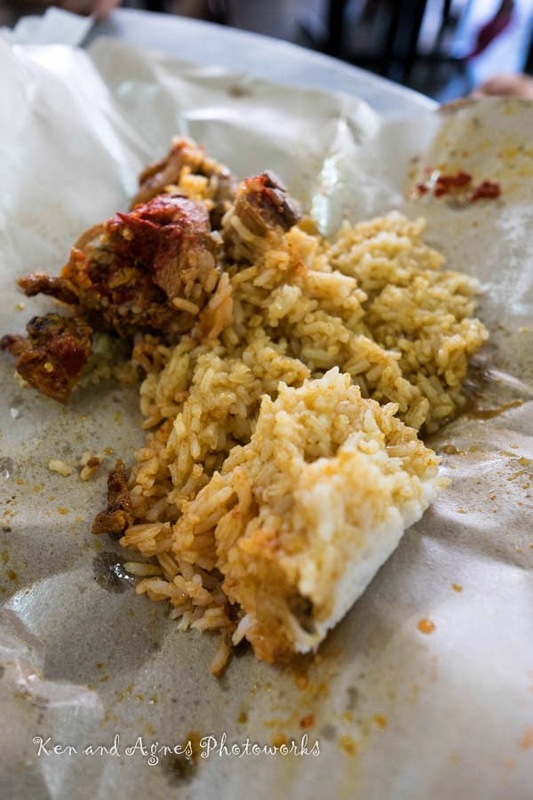 Located just across the Merang Mosque, this small eatery, which is hard to miss because there’ll be lots of cars parked next to it, serves one of the best nasi kerabu we’d ever tasted. Owners were friendly, and besides nasi kerabu, they have nasi dagang, nasi lemak, and nasi minyak (translate to oil rice) as well. The hubs who tried the nasi dagang claimed it was nice, so when he had nasi kerabu, he added the fish from nasi dagang as well; the girls had nasi lemak for 3 days with fried chicken and they like it too. I love the nasi kerabu so much, I didn’t try any of the other rice, and had the same thing 3 days straight. The plate of nasi kerabu which is RM5 comes with rice, fish cracker, a slice of salted egg, 2 pieces of freshly barbecued chicken, ulam (Malay salad), serunding ikan (spiced fish floss) a pickled onion and the secret sauce. So yummy I tell you. It was then time to leave The Summerland Retreat and move to our next destination, Kota Bharu. We used the coastal road. Nice kampung houses were seen all along the coastal road, although most of them now have Astro Satelite dish attached to them. This small quaint barber was empty when we passed it. We had lunch at Kuala Besut, the main jetty to get to Pualau Perhentian, and also had some sata, a Terengganu fish satay grilled on a gentle fire fueled by coconut husks. Then we reached Kelantan state. 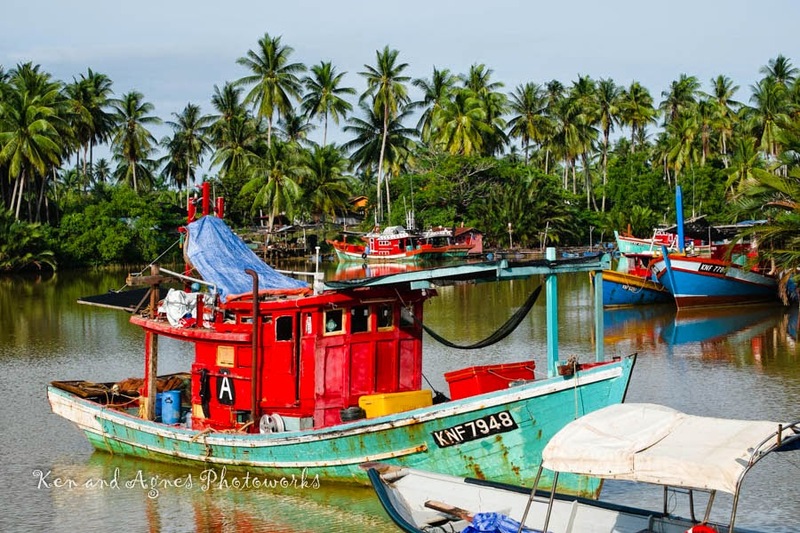 We drove passed Tok Bali, a small fishing port, before we headed inland towards Kota Bharu. There were lots of clam stall at the road side selling the big clams we saw in Setiu Wetlands. It was meant to be a 2hr journey from Merang to Kota Bharu, but it took us 4hrs using the coastal road and making numerous stops. When we finally arrived at Hotel Perdana, our hotel Kota Bharu, the girls were so glad; more so we got upgraded to a Deluxe Premier room, a big and modern room. After many days of having Malay food, we were craving for Chinese, so we went to Four Seasons Restaurant, a halal Chinese restaurant; it was ok food. Unlike most urban kids, our girls don’t own an iPad, don’t have free access to one (they can only use it as a dictionary freely), and neither can they watch TV as and when they like. They are only allowed TV or the iPad time if they have earned it, such as, they have done a page of writing, or some worksheets I’d given to them, etc. Today, I went out for a long lunch, and came home to find the girls have created their own toy with a box which was used to deliver my shopping 2 days ago. They have created a vehicle which they claimed can be converted to a ship, a car, a plane. With a very special control console. She said, the car drives automatically without human control. They created a smart phone too with all the Apps they are interested to have.The 1st app on the right on the 2nd row is photo gallery according to Zaria. The paw is an Apps for animals, and she hasn’t figured out what it can do yet. And of course, how can someone do without an iPad, loaded with all the important Apps. Love to see the girls do this instead of just being glued to the TV or gadgets. Possessing local knowledge helps tremendously in a trip, with this Taiping trip, we just referred to our “Where to eat” list from Zaria’s teacher, not having to hunt around or experience any disappointment during meal times. The kuey teow soup is supposed to be famous, with a choice of your own topping (fish cake, fish ball, stuffed tofu etc) tasted alright with a nice soup and smooth kuey teow. And we saw lots of people ordering the chicken feet, which we should have tried but didn’t. What we really like is the Kakak Ping 家家冰, which is a cold Nescafe mixed with barley drink; a unique combination, which made the Nescafe has a slight malty taste. The place is opened early in the morning, and sold out quickly, especially the Kakak Ping. We went back the following day at noon, missing the Kakak Ping already only to find they have sold out. No photos were taken at the coffee shop as it was a mad morning rush when we were there. As the coffee shop is located in town, we had a stroll around town after our breakfast. The girls were fascinated with a shop next door to Restaurant Kakak, which sells animal food, chicken feed and also chicks. The road that attracted Zaria, Jalan Boo Bee (just because it sounded like boobies) is just nearby. Nice pre-war shop houses around town. And we like all these old style shops. Here are some other places we’d been for something to eat..
It’s a bustling hawker centre beside the KFC Restaurant in town. We went there for supper, and hence couldn’t order much, but the cup of tea made by one of the stall was really good. The ‘barista’ deftly made cups of coffee and tea from the tiny kitchen was interesting to watch. We tried the chee cheong fun (flat rice noodle) there which was drenched with a reddish sweet sauce with generous topping of friend shallots and toasted sesame seeds. Unlike the brown sweet sauce we get in KL, this red sweet sauce is nicer and more fragrant. Best place for lunch I believe, as we went three times, once late afternoon, where some of the stalls were finishing up and closing, another before noon, but the Nonya kuih stalls were just about to start their business, and another time slightly after lunch, and the stalls were all bustling with activities. Famous stalls include, Fishball kuey teow (stall number 78); it’s actually like a dry soy sauce fish ball noodle getting fried before serving. Unlike the fried kuey teow that we are used to, this one is a little wet, and the noodles are thicker cuts; I think we prefer the usual fried kuey teow. Red Bean Soup 红豆水 and Groundnut Soup 花生汤 (stall number 40); We can just keep going back to this stall. The red bean soup is so rich and thick (but not bitter); while the Groundnut Soup is so fragrant, with melt in your mouth groundnuts. Best of all, only RM1.40 per bowl! All stalls in Larut Matang Food Court have sign boards which indicate their stall number. There are also two traditional nyonya kuih stalls (in front of the fishball kuey teow stall) which sell a huge variety of nyonya kuih. This place was so good, we had dinner there two nights in a row. The BBQ stingray is not to be missed, but the asam steamed fish is also fantastic. On the eve of Zaria’s birthday, she, who’s the only pork eater in the house, wanted sweet and sour pork for dinner, so we ordered this for her in Mr BBQ. She said it was really delicious as well. We chanced upon this when we googled for a bakery to get Zaria’s birthday cake. This bakery has been operating for more than 90 over years, the bread and the chicken pies are famous. They have also progressed with time and now they make fondant cakes as well. Besides getting a slice of cake for Zaria, we bought lots of buns and bread too, and they were all quite nice, some of the bread like the cream roll, sure brought back some childhood memory. Zaria said the slice of cake we got her tasted very much like my cake, meaning it’s very home-styled. Kuala Sepetang has many seafood restaurants but this was recommended by our friend. The fried little crabs are not common, but I think the fried little shrimps are nicer. They are so tiny they could be eaten whole. We tried the Bismillah Cendol (Jalan Barrack) as well, but maybe because we are not cendol connoisseur, we didn’t find it that nice (Just like we didn’t find the famous Penang Road Teo Chew Cendol nice as well). As for hotel, we stayed in Sentosa Villa which is at the fringe of the Lake Garden. We got a family room at the main hotel block. Room is huge and clean but without any character. I think staying in the family villa would have been better (but they are quickly snapped up). The hotel surrounding is beautiful, we only realised this when we stayed back on the last day for breakfast. There’s a natural stream and pool in the compound. And there are chickens, ducks, turkey running around in the garden, which the girls were fascinated with, trying to feed them with bread from the breakfast buffet. They also tried catching some fishes from the pond, and because there were so many, they could actually scoop them up with their bare hands. To end our year last year, we made a trip to Taiping and spent 3 days there. My memory of Taiping was of a drive we took many years ago (before the children came) passing the big angsana trees at the Taiping Lake Garden, last year, after gathering some information from Zaria’s teacher from Taiping, on what to eat, and what not to miss, we decided to make a trip there instead of Ipoh (which we’d been going for the previous 2 years at year end). These are the sights and the places we visited in Taiping. Refer to this other post on where to stay; where and what to eat. The first public garden established in then Malaya; huge and scenic, the garden has lots of huge gigantic rain trees or Angsana trees lining the lake with its branches stretching from the road to the waters. This place obviously is a popular place for various exercise. Soldiers did their physical exercise and this few didn’t mind a photo taken after completing their sit ups. There was a coach (Volunteer? Assigned?) doing some stretching exercises on the stage, with those interested following. Small exercise groups did their own routine. This group doing taichi. And this group doing fan dancing. The huge trees were so fascinating, the hubs just couldn’t stop taking photos. Such a big beautiful park, so picturesque. The lucky residents of Taiping, we envy you! The oldest hill resort in Malaysia, perched at 1250m above sea level, it is the wettest place in Malaysia, with temperature ranges from 10C to 25C. Access up the hill is available only by (government owned) Land Rovers although people are free to walk up the hill as many do for exercise. The journey up the hill is about 13km, so we decided to take the Land Rover, and then walk down. The Land Rover operational hour is from 8am to 5pm daily with a frequency of 1 hour. Fees is about RM5 for adult and RM3 for children. We bought our ticket for a specific time slot, waited at the stop 15mins earlier, (but like all things badly operated by the government) but the land rover just zoomed passed us without even stopping for us (he claimed he didn’t see us later). We complained at the office (nobody was mending the ticketing office as it was 1:30pm on a Friday, prayers time), but was asked to wait for the next available Land Rover (coming down from the hill) to bring us up. So we reached the top of the hill in the next available Land Rover late afternoon; it was a thrill ride all the way up, the roads were narrow with sharp bands, I chose the front seat, and tried not to get nauseous while the girls were screaming and shouting like they were on a roller coaster ride. The weather was nice and cooling at the peak, but we didn’t see anything operating, the cafeteria, tea garden were all closed, and I wasn’t sure if any of the bungalows were habitable. Whatever buildings we came across looked dilapidated. We didn’t spend much time up at the top; took the next available Land Rover downhill but alighted midway and walked the rest of the journey to the foot of the hill. On foot, we were able to enjoy the fresh air (diesel smell on the Land Rover) and the flora and fauna available. The last 3km we decided to take one of the jungle trek instead of walking on the tar road. This is the popular exercise trail lots of people take, but it’s not an easy trail especially with children. It was steep all the way, with lots of tree roots forming steps, and ropes provided to assist with the climb/descent at some part. Zaria, the fearless, took the lead all the way. The night before Zaria’s 7th birthday, we asked her what she would like to do in Taiping, and knowing there’s a night safari at the Taiping Zoo, she said she wanted to go just there. Taiping zoo is located in a beautiful natural setting in Taiping Lake Gardens and pretty well maintained. Ticket was RM20 for adult and RM10 for children for night safari. The animals were healthy looking, and some were very active in the night, like this clouded leopard which we could watch so closely through the glass cage. 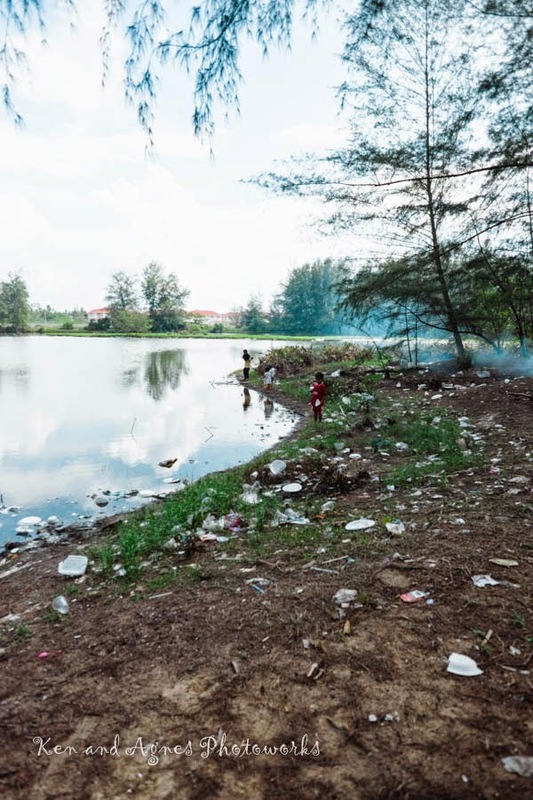 Kuala Sepetang (formerly known as Port Weld) is a coastal town famous for its mangrove forest and also charcoal factories. The Port Weld railway station was located at the centre of the town, now dismantled, it was the last station up North on the first railway line in Peninsular Malaysia. On the way there, this huge green piece of land was covered with cement buildings for housing swiftlets for their bird nests. We had lunch at the fishing village at Kuala Sepetang, and bought some dried seafood. A visit to the charcoal factories shouldn’t be missed when one is in Kuala Sepetang, in my opinion (here is the direction to get there). We always go to Mr Chuah’s factory. There’s a smokey smell in the air upon arriving. The factory has many huge beehive like kilns to bake big wooden logs until the moisture is gone and turn them into charcoal. These logs, stacked outside of the factory, is ready to be baked. 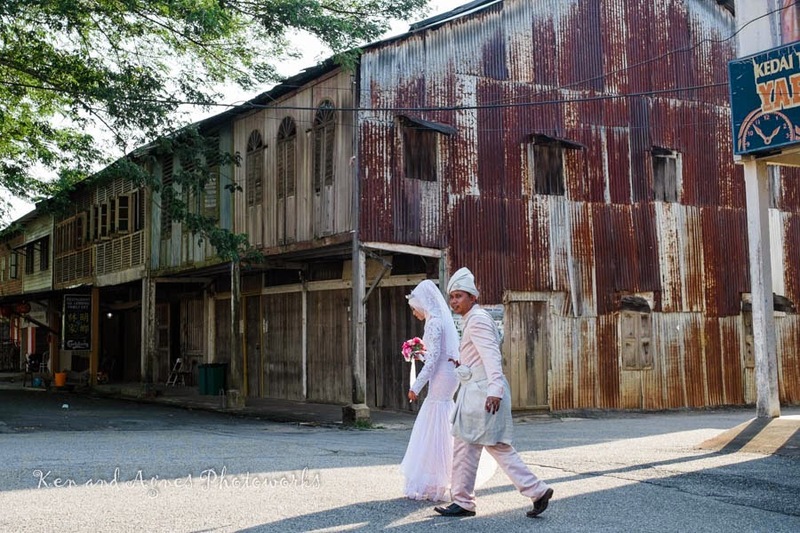 This place has a nice charm, and it’s probably quite popular for wedding shots. And of course, we took the opportunity to take some arti-farti shots too. Zaria doing a bridge. Me doing a Reverse Warrior pose. My current favourite bag from Ki Ichizawa gets an ‘advertisement-like’ shot too. And Zaria trying to push a cart loaded with charcoal. The charcoal produced here are mainly exported out to Japan (no wonder their yakitori there is so delicious), but visitors are able to purchase them too. We grabbed 3 big packs, freshly bagged. Last day in Japan, and I woke up with a massive migraine. I asked the hubs to bring the children out without me but they preferred to stay in with me. Good thing was after sleeping for 2hrs, the migraine went away, and we could still shop and explore for one last day before we left. First stop was Doguyasuji 千日前道具屋筋商店街, a small shopping street which sells kitchen and baking wares/utensils. For a small street, we spent quite some time there, and I got myself a clay pot, a bread knife, a cast iron kettle, two thermometers and an aluminium pot; I made sure everything I got was Made In Japan to worth the effort for carrying them back. Cycling seems to be very popular in Osaka and Kyoto; if it wasn’t for the busy traffic, we would have opted to use the bicycle too; maybe in future trips when the girls are older. After that it was off to lunch. Our first western meal in Japan at Bene Pesce. For about ￥800 for a set lunch, the food was not bad and of good quality, like all things Japanese. We lugged all the things we’d purchased, and headed to Namba Station to store them in the locker. Because the hubs has patiently waited for me to shop at Doguyasuji, I had to agree to go to Shinsekai 新世界; one of the poorest area in Japan, it has a unique character and tackiness that is not found in other parts of Japan. The moment we got out of the train, it’s as though we’d been transported back in time to a notorious and dangerous part of Japan. People were sloppily dressed (Zara said every one looked like a gangster), some looked dirty and zombie like as though they had not taken a bath or rested for quite some time. Shinsekai is famous for cheap eats as well; we saw lots of small restaurants lining the streets, and they were mainly ‘standing bars’ or in Japanese 立吞, where the Kanji characters translated to ‘stand and swallow’ (I understand it’s now also a popular restaurant concept in Taiwan). I had to ask the hubs walk ahead of us to ensure the ‘coast’ was clear before we followed him. There are a lot of Pachinko Parlour in Shinsekai too; hubs went into one of them to have a look. If the restaurant signboards in Dotonburi is tacky (but acceptable), the ones in Shinsekai brought it to another level. Most of the restaurants have the Shinsekai Mascot Billiken that’s supposed to bring luck. Luck or not, it looked hideous. We didn’t have dinner there, because the girls were uncomfortable with the people they saw there. So if we were not after the cheap food, why were we there? This was all because the hubs wanted to photograph the vibrant colours of Shinsekai (no doubt it’s colourful) and the Shinshekai Tsūtenkaku 通天閣, which means “Tower Reaching Heaven”. We were there late afternoon till night time, so the hubs could take the tower under natural light, and also when it’s litted. So he took photos of the tower from different angles, of the tower itself, and also from the busy street. He spent so much time there, the girls and I got really bored since there were no shops interesting enough for us to spend time in; and we had tackiness overdosed! Finally when it was time to go, we were so happy! It was back to Dotonbori 道頓堀 and Shinsaibashi 心斎橋 for more shopping. While we were walking around looking for restaurant to have a quick meal, a group of men were standing outside a small eatery chatting loudly. They started chatting with us too, i.e. where we were from, if we were enjoying ourselves etc. We asked what they were waiting for, and one of the guy mentioned onigiri. He told us the eatery sold really good onigiri, and we should try it. And so we did! It was one of the best onigiri we had tasted, they were made on the spot, it was so good we went for seconds. For the record, the name of the eatery is めはり屋文在ェ門 (pronounced as Mehari-ya Bun-zaemon). After our light meal, we did all the girls’ shopping at GU, sister company of Uniqlo, where things were much cheaper. The girls bought 4 pairs of shoes from there, 3 were UGG like boots which were going for ￥500. Then we came across Laduree at Daimaru, so we had to had some (moreover, a mochi costs the same amount as a Laduree macaron, i.e. ￥300, in Japan). We took 2 each, as we absolutely love (good) macarons. Choosing which piece of heaven we wanted to taste was tough though. Finally, a little more of Osaka by night, and it was time to go. The following day, after breakfast, it was time to leave for the airport. It’s been a good trip, and we can’t wait to return again. Osaka, being the 3rd largest city in Japan, has a train network that is quite complicated. Every train trip, I (yes, read I, not we) had to plan out the route and then purchase the ticket. The plan for the day was to go to Osaka Castle Park 大阪城公園 and then Namba 難波 in the evening. Osaka Castle Park 大阪城公園 is a the second largest park in Osaka, a very beautiful and pleasant park, which attracts lots of locals as well as tourists. It seems to be a very popular place to take wedding shots, we saw a couple of them; but this one seems to be having a great time getting their shots done. We saw a few groups of children on a field trip there. As the park is near the Osaka Museum of History, it’s probably a good place for children to go for a field trip to cover both places. The park has lots of benches, and places to rest, and people do make good used of it. When it was time for lunch, we got ourselves Nissin noodles from the park vendors. The girls kept saying it was the best instant noodle they had ever tasted. Ha. Lots of people brought their dogs for walks the park. People in Osaka are generally more friendly than other Japanese, when the girls showed interest in their dogs, they slowed down to let the girls pet them. One lady let Zaria carried her dog, Nana; and Nana was so taken by Zaria (or was it because she tasted Nissin soup on Zaria’s face) she kept licking Zaria’s face! Strolling around the park was extremely pleasant, and we could see the Osaka Castle from almost every where in the park; and it’s extremely beautiful in the evening sun light. One part of the park had lots of ginko trees, which have beautiful yellow leaves on the tree and scattered on the ground. After a stroll around the park, we headed back to the train station located near Osaka Museum of History 大阪歴史博物館 and took the train to Namba and then walked to the shopping dining paradise of Osaka, Dotonbori 道頓堀 and Shinsaibashi 心斎橋. Bright neon lights, LCD billboards brighten up the place. And when you are there, you will never miss the tempting scent of grilled crab from Kani Doraku Dotonburi かに道楽. They purposely grilled it at the front of the restaurant to lure customers I believe. For ￥700, we got a small portion of grilled crab and ate standing. The crab siew-mais were also very nice. ￥500 for 3 pieces, we bought 3 portions as they were just too delicious. For dinner, we chose a conveyor belt sushi restaurant. I love the tacky restaurant signs in Osaka. Unlike the signs in Kyoto, they are loud here. And they like using 3D signboards. Some are also quite artistic. After some shopping and walking, we passed by Kinryu Ramen (金龍 ラーメン), and thought of trying. So we queued up, ordered 2 bowls, and waited. There’s only char siew topping, but there’s condiments such as kimchi, chives, for us to add, so while Zaria had all the char siew, hubs and I shared the rest with heaps of condiments added. It was quite nice, and Zaria claimed it’s the best ramen she’s ever tasted and the char siew melted in the mouth!